I am a Green MP in New Zealand and our party's foreign affairs spokesperson. I am disturbed by reports of actions being taken against Professor Jose Maria Sison, who has been a refugee in your country for many years. I have met Professor Sison and read a lot of his articles and it is clear to me that he is an important political analyst, who has written many articles and books on the Philippines. It stretches the imagination that someone so engrossed in scholarly works in the Netherlands is somehow responsible for terrorist acts somewhere else. It deeply concerns me that anti-terrorist laws are now being used against him. One does not have to agree with all that Professor Sison writes, and I certainly don't, to know that he does make a significant contribution as a political analyst. I would request that his rights as a refugee in your country be respected. Comment; Professor Sison is the leader of the Communist Party of the Philippines. He is also General Consultant to the International League of Peoples' Struggle, a worldwide Maoist organisation. Sison has lived in the Netherlands since 1987. 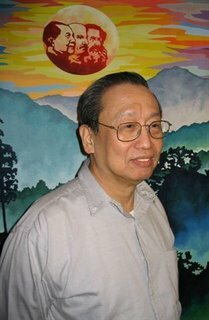 On 28 October 2002, the Council of the European Union added Jose Maria Sison and the New People's Army (armed wing of the Communist Party, now in its 35th year of war with the Philippines government) to its list of 'terrorist' persons, groups and entities. The Dutch government then began attempts to expel Sison. Keith Locke, who for several years ran the NZ Philippines Solidarity Network (which supported the CPP/NPA and once sponsored a visit by Sison to NZ) clearly thinks the liberal Dutch are being a bit tough. The CPP/NPA have murdered thousands in their decades long war. Why is a "peacenik" like Locke, supporting terrorist killers. Maybe someone from the Green Party could enlighten us? Didn't he learn a lesson from his support for Pol Pot's Khmer Rouge? The Greens need to reshape themselves and purge out the extreme left element which makes them so unpalatable. Rod Donald was the appealing face for the party, but now he's gone they just look like a motley collection of nutcases. I've said it before but Locke just hates America and any Government aligned with America. Inject him with Sodium Pentathol and he'd be singing the praises of Osama Bin Laden I reckon. AHOib6 The best blog you have!